We have the best performance pellets for your pellet stove. What does performance in a wood pellet mean? Well it means there is less maintenance for you. It also has less wear and tear on your wood pellet stove. There is also less waste in the bag. You get a lot of benefits and all in a product that is clean burning energy, costs less money than other forms of fuel and is made, not just in the USA, but right here in your neighborhood. 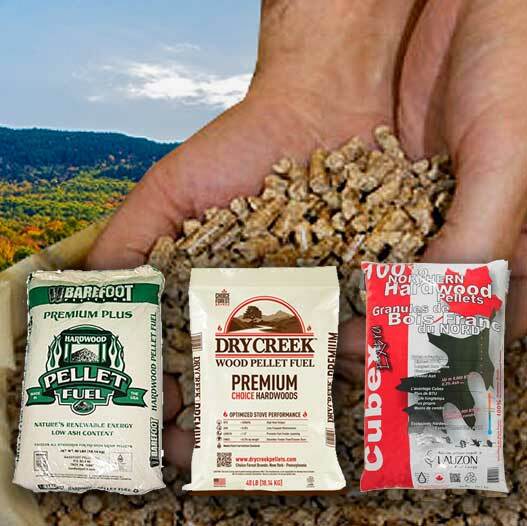 Dry Creek, Barefoot, and New England wood pellets offer great benefits. These premium grade pellet fuel are made from a blend of hardwood and other wood species. These pellets can be found at many retailers throughout the Northeastern. Our Regency pellet stoves have been certified by the Environmental Protection Agency and meets strict clean air standards. Regency engineers have carefully designed the firebox to create airflow around the pellets so that it burns effectively, resulting in very little ash and almost no polluting smoke into our environment. We offer both free standing and insert pellet stoves. Both have a very attractive and sleek design and they both offer great performance when it comes to keeping your home warm, so saying goodbye to that old drafty, cold room. You will find that our stoves have a wonderful features that produce maximum heat with low ash for clean up. Can add that rustic look and natural ambiance to any room in the home with a Regency pellet stove. If you are looking for an insert our Greenfire pellet insert is designed to fit! 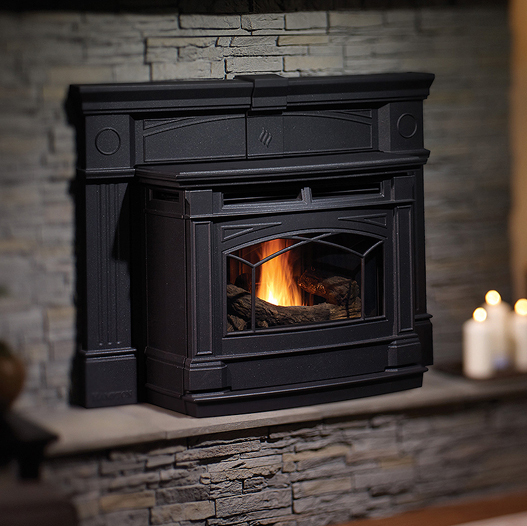 Height is of no concern; with an adjustable hopper, the GFI55 will insert into fireplace openings as low as 19.5″. Incorporated into each Greenfire is an advanced air wash system. Engineered to keep your glass clean automatically leaving you a clear view of your fire. Pellet stoves are an environmentally friendly way to heat your home and save money. They are quiet, efficient and cost effective home heaters that fit perfectly into your lifestyle.